The moon, our constant silvery companion. The oceans move in unison with its expanding light and darkness, and these tidal influences played an important role in beginning life on earth. Like a gatekeeper to the cosmos, it’s always there in the night sky on stand by. For millennia, humans have used the movement of the moon to track the passing year. In ancient times, often the change in season was tracked not by the solar year, but by lunar months. 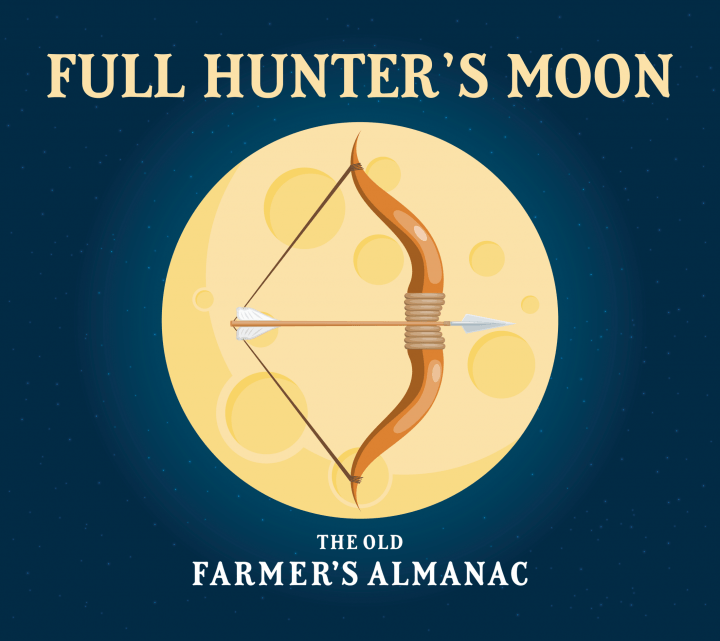 When our hunter and gatherer ancestors stopped moving to adopt agriculture, moon phases became important signals that it was time for hunting, planting or harvesting. While the sun orchestrated the calendar, the moon regulated seasonal activity. Cultures around the world have given full moons names based on the weather, or behavior of plants and animals during that month. In skylore, the October full moon is called the Hunter’s Moon. It’s the time when peoples indigenous to the Northern Hemisphere would hunt by the silvery light of the full moon. Since a long winter brought with it the possibility of going hungry in pre-Industrial times, the hunter's moon was given special distinction. It was an important agricultural observance, when the final harvest was taken and the people were now dependent on the stored harvest or on hunting animals for their survival through the winter. The previous full moon closest to the autumn equinox in September is called the Harvest Moon. During the harvest moon is when the fields were traditionally reaped and harvested. The bare fields attracted deer and foxes that were drawn to the fallen grains. By the light of the next Hunter’s Moon the hunters could stalk their prey in the bare harvested fields under the autumn moonlight. 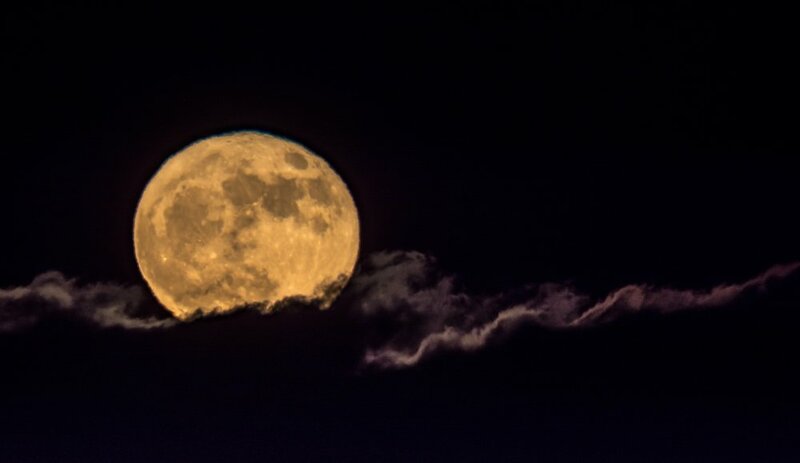 The October full moon has a distinction: the shortened time between sunset and moonrise. Because of the ongoing light, it was the perfect night to hunt. It’s also called Blood Moon, or Dying Grass moon. Historically, the night of the Hunter’s Moon was also a feast day. In addition to hunting, people might celebrate with a feast of plenty. A good harvest and stockpiled food was something to celebrate, especially for a tribal people for whom a bad season meant facing a long winter of famine in which many might not survive to see the spring. In October, the harvest being over, the seeds for the next years crops are planted. They'll lie dormant until February, when they will finally begin to sprout. By May they will have shown growth, and it is this time of year that is concerned with the fertility of the coming harvest. Those same crops will be harvested by the autumn moon again, and the cycle begins anew. Survival was deeply tied to the land, so it’s easy to see why rituals would have been developed around it’s cycles of growth, dormancy, and renewal. Seasonality is perhaps one of the oldest, most primordial truths. We have always been spinning on our axis, in shadow part of the year and in sunlight the rest. Before clocks, schedules, or alarms, we took cues from celestial signs on how to live; when to prepare for winter, when to celebrate for summer. Our survival was (and still is) deeply tied to the ways we lived under and worked with the cycles of Earth’s seasons. 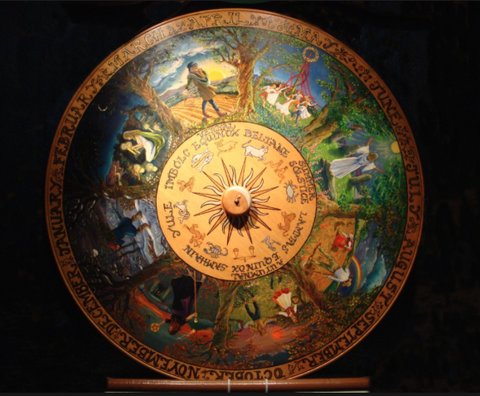 The ancient wheel of time was separated into equinoxes and solstices. The shifting patterns from light and dark, heat and cold, and the cyclical paths of the Sun, Moon, stars, and eclipses were pondered ever since our primeval ancestors first gazed out at the starry heavens. Their daily rhythms ruled each of the various stages of human life. Ancient cultures considered the flow of time to be a cycle without beginning or end. Since people were mostly farmers, hunters and shepherds, they lived and worked intimately close to nature. It was important that they knew the nuances of the land to survive. They observed that the various phases the moon passed through in a month coincided with reliable events happening in their environment. Using these cues, they learned to plant, harvest, fish, hunt, and make predictions, all by the light of the silvery moon. Lunar moments have held significance to humans for a long time. Sure, we might no longer rely on lunar cycles to track our activities, or need moonlight to hunt for our survival. But a growing trend is drawing on ancient beliefs to understand the role the moon plays in connecting us to nature and it’s creative power. It’s part of the ethos of the Folk School to explore the meaning behind those connections. Perhaps we can use the phases of the moon to bring what is hidden into light, just as the autumn hunter is guided by the light of the moon, and the signs that are hidden within nature. Join us Oct 24th at 6pm on Bishop’s Beach for a fire building class followed by a lunar celebration of the season! Sign up here.